...no matter the size of their bank accounts. Whether you are an individual, couple, small group, or leadership team, No Strings leads you on a personal journey to explore money questions with God and your Christian community. Over twelve interactive lessons, you will assess what Scripture teaches about possessions and pursue honest and real conversations with yourself and God about what really matters to you regarding money. "...Have you ever considered how your relationship with money could hamper your ability to live out these great commandments? Might your heart have some entanglements with your treasure that need to be explored for you to love others and God more freely? When we become serious about the task of loving, we inevitably need to consider what may be standing in the way of our ability to love with our whole hearts. In this study, we focus on what is involved in living out the two great commandments, to truly become a loving person within our Christian community. To that end, we are intentional about evaluating if our money, treasure or possessions are serving our love for God and others or if we are instead serving our resources or ourselves..."
How does money compete with our relationship with God? What does our financial history and reputation tell us about our hearts? How do possessions affect our sense of identity? Who or what do we turn to for security? How can we learn contentment? How can we partner with God in all of our financial dealings? No Strings leads participants through practical exercises that illustrate the impact of Jesus' teaching on money when applied to our everyday lives. Supplemented by 12 audio podcasts, the workbook features real-life activities that hone your ability to observe, converse, and prayerfully reflect upon financial matters. No Strings empowers Christians in leadership positions with additional questions, assessments, and applications specific to leadership environments. Whether you work in a nonprofit, church, or corporate environment, No Strings will direct you to consider how your attitude toward money affects your place of employment. 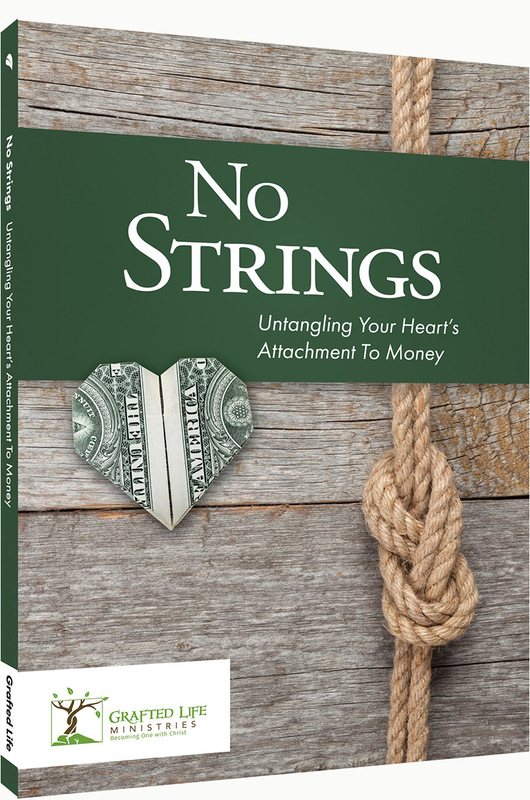 How can we untangle the strings of our hearts that are attached to money and possessions? It begins not with the mechanics of budgeting, saving, or getting out of debt, but with what Scripture teaches about possessions, finances, and our hearts. Grafted Life Ministries exists to root lives in Christ's transforming love. We create resources for Christian leaders and lay persons to help them practice Biblical principles in their relationships. Wondering if No Strings is right for you or your small group? Give us a call at (214) 919-4145, or send us your question below. We’d love to connect with you. As an added bonus, we’ll send you two complimentary resources that quickly evaluate the impact of your personal and professional leadership around money.